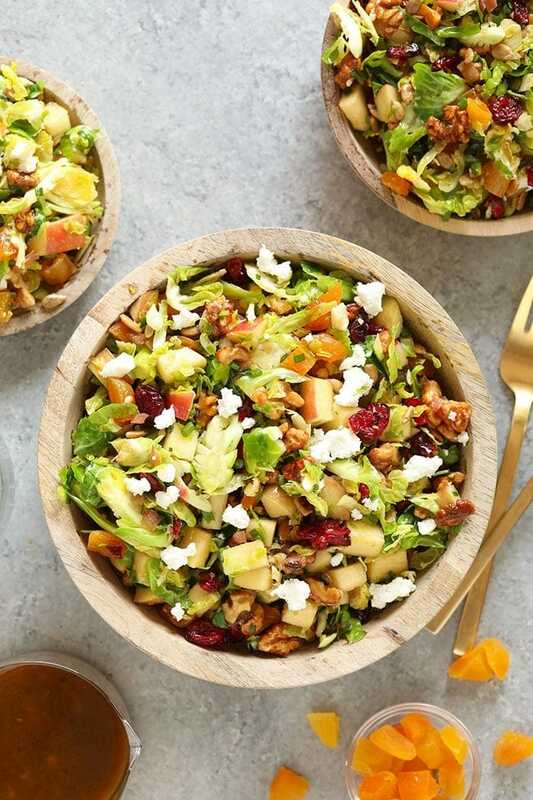 This Shaved Brussels Sprout Salad is fresh, flavorful and tossed with a healthy balsamic vinaigrette dressing. Dare we say the best of all worlds? 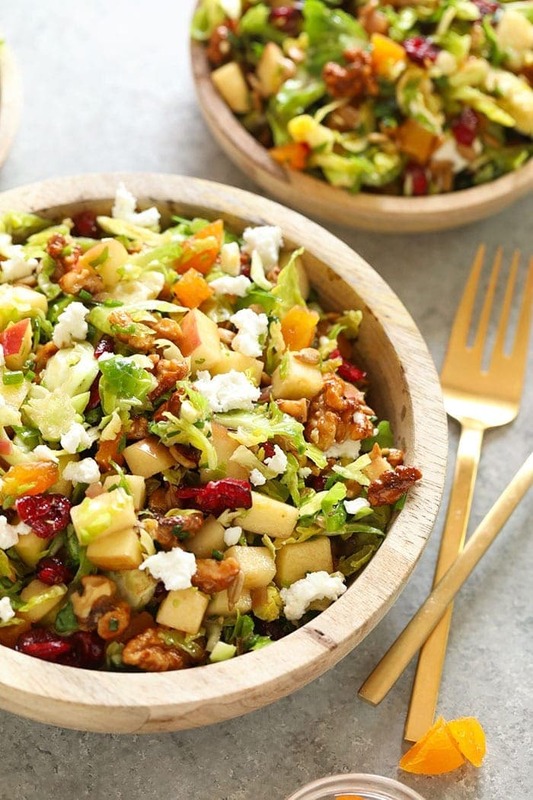 From diced apples to dried apricots to candied almonds, and, of course, shaved brussels sprouts, this salad truly has it all! Enjoy. Calling all loaded salad friends! 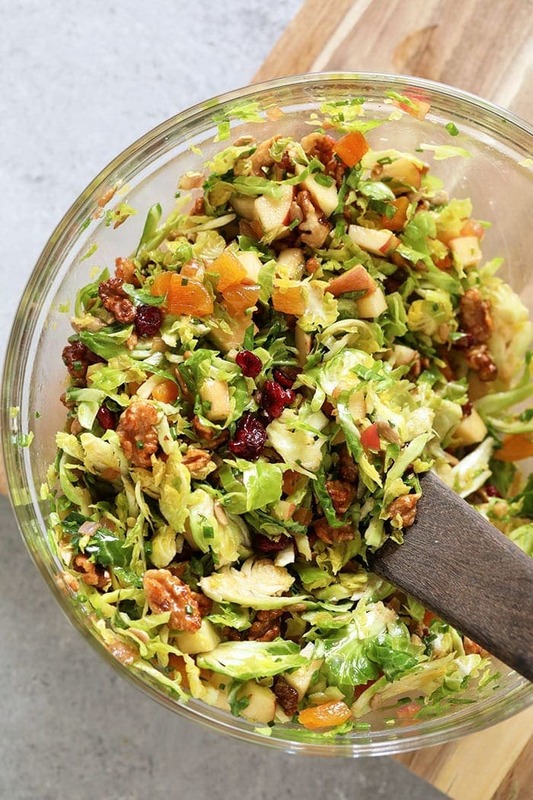 This shaved brussels sprout salad recipe has your name on it. The perfectly sweet and nutty combination of these flavors together with the jazziness of shredded brussel sprouts (or do say shaved?! BIG debate over here at FFF) makes for the most delicious and nutritious shaved brussel sprout salad your cute little taste buds have ever experienced. Lez get into it, shall we?! 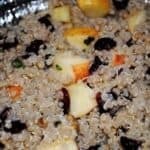 What a tall list of healthy, delicious and easy to prepare ingredients we have here. Shaved brussels sprouts: (obviously). We bought an already shredded bag of brussels sprouts at Trader Joe’s. Most major grocers will have an already shredded option for you! 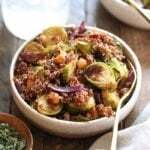 But, if you prefer to shred your own, simply trim the bottoms off fresh brussels sprouts and coarsely chop using the slicing attachment in your food processor. If you don’t have a food processor, you can shred your brussels by hand by thinly slicing each brussel vertically. 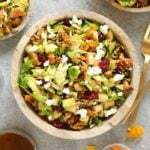 Dried apricots: in this recipe, we cut our dried apricots into fourths to spread that apricot-y deliciousness throughout the salad. Dried cranberries: feel free to sub raisins if you prefer that flavor to craisins! Sunflower seeds: we recommend the already shelled sunflower seeds to avoid the oh so tedious work of shelling your own. Candied walnuts: we love to make our own candied nuts in the oven. For these perfectly candied walnuts, you’ll simply toss 1 cup of raw walnuts with a tablespoon of maple syrup and a pinch of sea salt and then spread on a baking sheet. 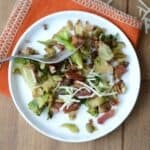 Bake these at 400 for 10 minutes (stirring half way through), which should be just about the perfect amount of time to prepare the remaining ingredients for this brussel sprout salad recipe. Apple: feel free to use any apple you have on hand. 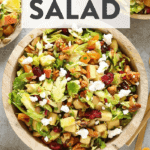 We used a honey crisp apple for this recipe, and it gave the salad a nice sweet tang. 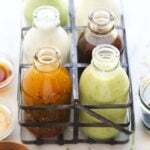 Homemade balsamic vinaigrette dressing: we have a great recipe for this on FFF, but if you’re in a pinch, feel free to use any store-bought balsamic vinaigrette dressing instead. Crumbled goat cheese: we love how the goat cheese crumbles pull the flavors together in this recipe, but if dairy ain’t your thing, feel free to omit! 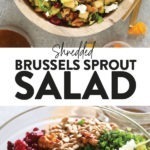 And now that we’ve got the attention of all you brussel sprout lovers out there, take a gander at our wide selection of brussel sprout recipes here on Fit Foodie Finds. From fresh to grilled roasted, get your brussel sprout fix right here. Spread walnuts over a baking sheet and drizzle with maple syrup and salt. Stir and make sure all walnuts are covered in maple syrup. Let cook for 10 minutes (stirring halfway) and remove from the oven and let them cool. While walnuts are baking, placed shaved Brussels into a large mixing bowl and drizzle with olive oil and salt. Massage with your hands for 2-3 minutes. 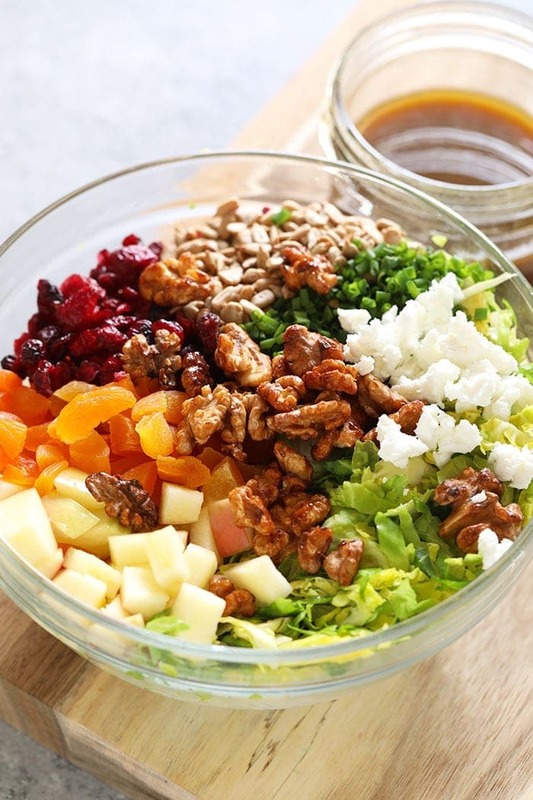 Next, place walnuts and the rest of the salad ingredients into the bowl with the brussels sprouts and mix well. Make sure all vegetables are covered in the salad dressing. Store in the refrigerator and let chill in the fridge for at least 30 minutes. Enjoy!